It's hard to believe, but we are merely one day away from the Patriots trimming their roster from 90 to 75 players, two days from their fourth and final preseason game, and a week from their final cutdown to a 53 man rosters. With so much depth on this roster, plenty of guys were playing for their jobs Friday night against the Panthers. I used the NFL's GameRewind to take a look back at the film from that game, keeping the impending roster cutdown in mind as I jotted down my observations. All eyes were on the quarterbacks heading into Friday's game, particularly once news broke during the game that Tom Brady would play at some point against the Panthers. Many in the media spent the week pushing the scorching hot take that Brady was being selfish by attempting to take reps from the younger Garoppolo, but Brady's hot and cold performance illustrated both the rust of a long offseason and the need for preseason reps to work out the kinks. Don't get me wrong, there were vintage Tom Brady moments sprinkled in, none more obvious than his perfect touchdown pass to Chris Hogan. 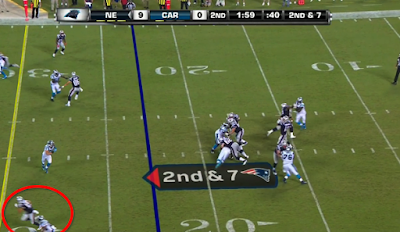 However, several plays were simply off in a way we don't normally see from Brady once the games begin to count. This was evident early, as Brady's second snap saw him force a ball to a well covered Julian Edelman. Holding onto the ball a split-second longer might have allowed Edelman to break free, as he was tracked by linebacker Shaq Thompson on the play, but the timing simply seemed off between the normally impeccable Brady-to-Edelman connection. Another such play came on Brady's third possession of the game. 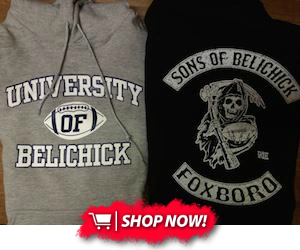 With 7:57 remaining in the second quarter, Brady dropped back, saw defensive end Charles Johnson beginning to break free, and immediately launched a throw in the general direction of a well-covered Martellus Bennett. The ball landed harmlessly out of bounds, setting up a second & 10. Had Brady held onto the ball a split-second longer, he might have progressed to his next read, where he had Chris Hogan breaking open on an in-breaking route over the middle. Such a play stood out to me as an example of how even a player with Brady's extensive experience needs reps against a live pass rush to stay mentally sharp in that kind of situation. Brady's attempts to develop chemistry with Bennett almost cost him on his final possession of the game. Second down saw Tom launch another pass in Bennett's direction without accounting for safety Kurt Coleman, who was in position to make a break on the ball. Coleman read the play beautifully and jumped the route, but Brady was bailed out by the veteran safety dropping an easy interception. A very uncharacteristic mental mistake from Brady, and yet another example that even the best the game have to offer need their reps to stay sharp at such a cerebral position. While Brady was up-and-down, Jimmy Garoppolo was mostly down, although a closer look at the film revealed some of the contributing factors. He certainly wasn't helped by the back-to-earth performance of his offensive line, which struggled at times in protection after excelling last week against the Bears, but there were times when Garoppolo's poor plays were his responsibility entirely. For example, the line gave him a picture-perfect pocket to work from in the first play following the two-minute warning, but he overshot an open Hogan on a go-route. It wasn't the easiest throw, as Garoppolo had to account for the safety coming over in support, but still a throw he'll be expected to execute once the games count. Instead of trying to squeeze the ball into a tight-ish window, he appeared content to miss wide and not risk adding a turnover to his unproductive night. That combination of protection and separation doesn't necessarily occur all that often the NFL, and the poor throw left a potential chunk play on the field. 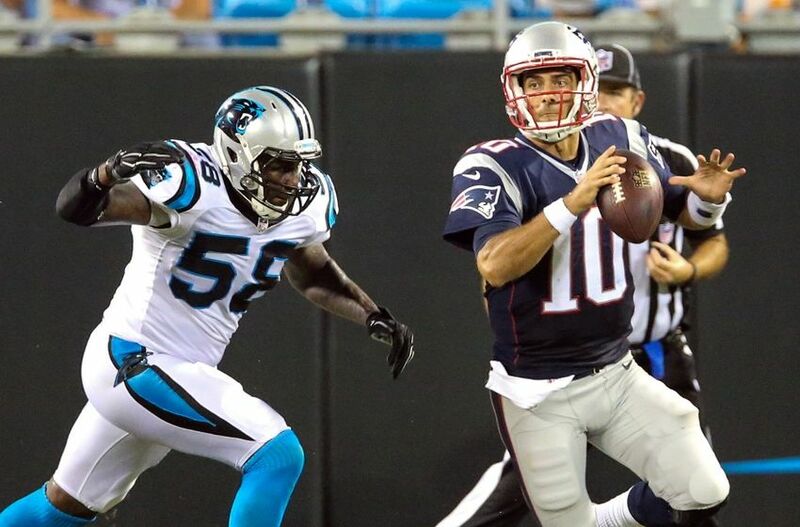 There were other plays where, as we saw against the Saints, pressure affected Garoppolo's progressions and accuracy. 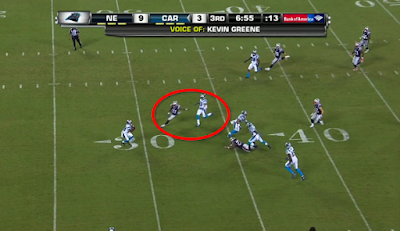 Garoppolo's near interception to Luke Keuchly, occurring on the first third down he faced, stood out as an example. 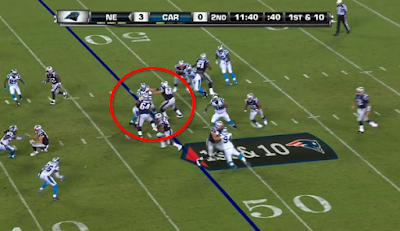 On the play, Panther's defensive end Kony Ealy had begun get around Nate Solder. 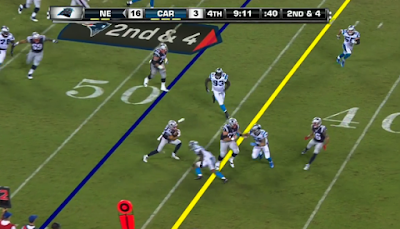 Sensing Ealy's rush, Garoppolo rushed an inaccurate throw over the middle to Edelman, and was fortunate that the easy interception bounced off of Kuechly's hands. The more astute play would have been to step up in the pocket (he had the space to do so), which might have given Bennett the chance to break free in the end zone. With that said, it's difficult to put the full blame for the offense's struggles on Garoppolo's shoulders. His second possession was done in by holding penalty on Julian Edelman, putting the offense in a drive-starting 1st & 20 situation from which they never recovered. On the his third possession, the offense was already in second & 10 when a collapsing pocket led to his intentional grounding penalty, killing the drive. The first possession of the second half was another one ruined by the following sequence from the offensive line: poorly blocked swing pass for loss of one, poor wham block (Clay Harbor) turning what could have been a big run into merely a 4 yard gain, third down sack fortunately negated by defensive offsides, third and three running play stopped short of first down yardage, fourth and one running play stopped short of first down yardage. Hard to pin that one on the quarterback. The bright spot from the Quarterback position came from Jacoby Brissett, who was a perfect 9-9 passing in the second half. Brissett has come a long way since getting drafted this spring, as he's gone from a player who looked like the game was moving too fast for him to one making decisive reads during live game action. Brissett's performance requires context as well. The training wheels appear to at least partially remain on with regards to the playcalling when Brissett is in the game. Many of his completions came on simple plays with an obvious primary read, designed to be high-percentage, low risk plays. The insertion of DJ Foster into the game with Brissett played to that design, as Foster was the recipient of several screens and swing passes that helped to bolster Brissett's completion percentage. However, Brissett also deserves credit for his handling of pressure, which is far better than expected for a rookie quarterback. Playing behind the second string offensive line, Brissett saw his fair share of pressure but was never rattled. One such play that stood out to me came at the 8:00 mark of the fourth quarter, where he calmly waited for the play to develop before delivering a strike to Devin Lucien, just as the Panthers edge rusher spun around LaAdrian Waddle to get in his face. The calm, accurate throw gave Lucien the ability to gain first down yardage after the catch. It once appeared that second year man Justin Coleman might at least initially hold off second round rookie Cyrus Jones for nickel corner duties early in the season, but that thought appears to be put to bed. Jones worked as the third corner with the starting defense, playing exclusively in the slot and holding his own throughout his defensive reps. His performance did nothing to cede that role, which he appeared to earn after a strong performance the previous week against the Bears. Jones also demonstrated the special teams value that factored into the Patriots drafting him, gobbling up yards with his decisive, downhill approach on punt returns of 20 and 60 yards. Coleman's roster spot should still be safe, as he's followed up his competitive rookie year with a largely impressive camp and preseason. That leaves at most two (and possibly just one) roster spot left at the position, where youngsters Cre'Von LeBlanc, Darryl Roberts and Jonathan Jones have all shown promise. As is the case with any battle for the last spot on the depth chart, special teams value could be a deciding factor here. Of the three youngsters, Jones helped himself the most in this department. With fellow rookie Kamu Grugier-Hill out with an illness, Jones worked on the top punt return and coverage teams as a gunner (coverage) and vice (return) and repeatedly showed up with positive plays on film. He particularly shined in his role as a gunner, repeatedly using his 4.33 speed to outrun his blockers even when double teamed. I counted three different times when, as the first man down the field, his presence forced the returner to call for a fair catch. 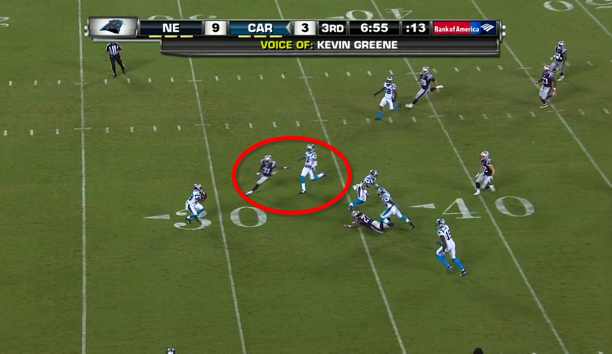 Jones also flew in to immediately make the tackle on another return attempt. Special teams might have to be Jones way onto the roster, as he struggled in coverage against the Panthers second and third stringers. While his athletic talent is obvious to the naked eye, so is the rawness in coverage that led to his undrafted status. For example, he appeared to show poor recognition, biting on a juke and allowing receiver Miles Schuler to "stack" him for a would be touchdown that was overturned on replay. There were some positive plays on defense for him (a tackle for a loss on a run blitz from the slot and a well-timed pass defensed amongst them), but he gave up easily the most plays of the three young corners vying for the final jobs on the roster. When it comes to the defensive side of the ball, LeBlanc seems to be the highest on the depth chart. Another undrafted rookie, LeBlanc was part of the second outside corner pairing once starters Logan Ryan and Malcolm Butler left the game. LeBlanc was paired with Coleman, with Jones continuing the man the slot in nickel packages. That group saw its share of time against the Panthers starters, including the massive receiving duo of Kelvin Benjamin and Devin Funchess, and showed up with competitive snaps. The undersized LeBlanc gave up separation at times to Funchess, but didn't give up any chunk plays against that first string group (Keyarris Garrett did beat him for a 35 yard play late in the fourth quarter). Darryl Roberts came in once Cyrus Jones was pulled from defensive action, pairing with LeBlanc on the outside with Coleman bumping inside to play the slot. Roberts had another active game in coverage, as he didn't allow a reception into his coverage despite being targeted a number of times in the fourth quarter. He also showed up on special teams, playing on the first string kick coverage team (where he contributed to a tackle) and working into the gunner rotation on punt coverage, where he drew a hold. Roberts has been in the special teams mix all preseason, and has rebounded from a tough opening game against the Saints with two consecutive strong defensive showings in coverage. While he appears to be currently behind LeBlanc for snaps on defense, he might have the best combination of current special teams value and developmental defensive upside of the group. The running back depth chart might be the murkiest on the team, and it got murkier with yet another name added to the mix in rookie DJ Foster. The undrafted rookie got plenty of hype throughout the spring, but his inability to get on the field this summer had many (myself included) writing off his chances for a roster spot. However, with Dion Lewis almost certain to begin the year on the PUP list and Brandon Bolden failing to impress this summer, there could still be an opportunity to steal a roster spot, and Foster appeared to capitalize on his chances Friday. Again, context is necessary in evaluating his performance. Foster entered the game late in the third quarter, along with Brissett and the second string offensive line. The Panthers defensive starters had been pulled at that point. However, the quickness and burst that had many projecting Foster as a threat to James White going into camp was evident on the film. As I previously mentioned, Foster was immediately involved in the passing game, with the Pats using his receiving chops (he converted to slot receiver as a senior at Arizona State) to manufacture easy completions for Brissett. While his blocking never afforded him the chance to break a big play, his burst was obvious, as he quickly used his speed to gobble up whatever space he was given. He also flashed elusiveness, making a man miss to turn a fourth quarter screen into a first down conversion. His lack of size will prevent him from being a between-the-tackles workhorse, but he used his quickness well to make defenders miss in the hole before exploding through the gap. He gained a solid four and five yards on his two carries, both on inside rushes. If Foster earns a roster spot, it will be as the primary backup to White for that passing down role while Dion Lewis continues to rehab his surgically repaired knee. Meanwhile, the battle rages on for early down carries. LeGarrette Blount seemed to separate himself with an explosive performance last week, but he and Tyler Gaffney seemed to split carries with the first string offensive line, indicating that the job is still very much up for grabs. Friday's performances failed to sway me from the conclusion I had already reached after watching the first two games: while both are more reliant on their blocking than you'd like from your starting running back, Blount simply brings more explosiveness to the position than Gaffney can offer. While he doesn't have a ton of speed or elusiveness, he ran hard and was productive with the first stringers. His above average instincts showed up repeatedly on tape, several times cutting back well to maximize his yardage. However, his ability to break tackles still looks limited, and his lack of dynamic ability in space isn't an ideal fit for the Pats offense. Blount certainly had plenty of juice Friday, with a productive night highlighted by his hurdling a Panthers defensive back for extra yardage, but fumbling on a swing pass (he was fortunate to fall on the loose ball) won't endear him to the coaching staff. 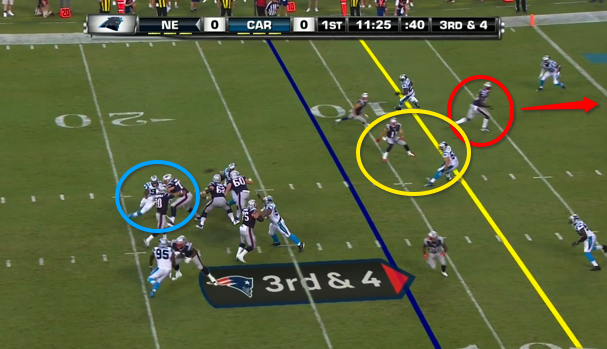 I still view Blount as the more explosive and better option to take carries Week One. Even if the coaching staff agrees with that assessment, Gaffney could stick as an extra level of depth on this thin depth chart. The interior of the offensive line looked like one of the teams deepest, albeit most unsettled, positional battles entering camp. However, injuries have taken out a chunk of the depth chart, creating opportunities for some of the younger, less-proven players on the roster at the still wide-open right guard spot. Jonathan Cooper opened camp as the presumed starter at right guard, but he went down early with plantar fasciitis and has missed all of the preseason so far. Shaq Mason appeared to be on his way to solidifying that spot, but promptly joined the walking wounded with a broken hand. Veteran Josh Kline, the team's steadiest lineman last season, started at right guard last week but didn't play at all Friday with the first stringers, working instead as the second string center. That led to sixth round rookie Ted Karras, who appears to have endeared himself to OL coach Dante Scarnecchia, getting the start Friday night. While there are things to like about Karras, he doesn't look ready to me to be an NFL starter, as he was repeatedly beat throughout the night. There are certainly qualities to his play that suggest he could be a contributor down the road, as he has a decent combination of size and length and plays with a noticeably hard-nosed demeanor on the field. When in close quarters, Karras showed flashes as a run blocker, using his power to generate movement on double teams. However, he doesn't appear to have learned yet how to use his noticeable length, too often allowing defenders to get to his outside shoulder for pressure. I still think Karras earns a roster spot as a developmental prospect with game day versatility to play any of the interior positions in a pinch. While Karras getting first string looks wasn't a huge surprise (he got reps there early in camp between Cooper going down and Mason returning from the PUP list), it was a big surprise to see Chris Barker rotate in at guard with the first string. Barker subbed in at left guard for Joe Thuney on the team's fourth offensive series (their first with Tom Brady under center) and played two series there. The next offensive series saw Thuney back in at left guard, with Barker switching over to the right side and Karras subbed out. After Karras took the next series at right guard (a three and out punctuated by a sack Karras was partly responsible for), Barker stayed on the field at right guard for the remaining snaps with the first string OL and quarterbacks. It wasn't perfect for Barker, who was beaten in protection twice during his first series of work, but he had a better day at the office than the more heralded Karras. Barker particularly showed well as a run blocker, repeatedly playing a role in the rushing lanes Blount and Gaffney took advantage of. The first snap of Brady's second series saw Barker seal off star linebacker Thomas Davis perfectly, allowing Gaffney to gobble up 10 yards before even being contacted. The next Brady possession began with Blount's aforementioned hurdle run, but Blount was able to get going on that play partly because Barker expertly used veteran defensive tackle Paul Soliai's momentum against him, sealing him off to open a crease for the big running back. 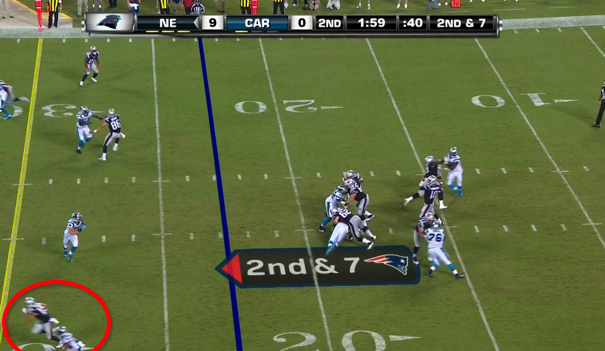 This was by far the best play Barker's shown in his Patriots career, as he's spent much of his preseason snaps out of position at tackle. His ability to provide depth at multiple spots in a pinch should help his admittedly low odds of making the 53 man roster. Of course, the veteran Kline is still around as a depth option. I didn't read too much into the coaches not playing Kline at guard tonight, as they already know what they have with him after last year's extensive playing time. Kline got all of his work as the backup center, where both he and Karras have gotten practice reps. Kline takes on a newfound importance as the backup here, as David Andrews is the only true center on the roster (barring a shocking change of heart regarding Bryan Stork's status with the team), but Kline was far from impressive in that role Friday night. Despite working against second and third stringers, Kline looked overmatched at times, getting driven back on several runs that failed to generate momentum. Perhaps some of that can be attributed to the adjustment of having to snap the ball prior to starting his blocking assignments, and its also worth noting that he appeared to injure his shoulder last week against the Bears. However, it's always troubling to see a previously proven veteran struggle in the fourth quarter of a preseason game, especially one counted on to be one of the steady presences in a group of largely young players. It's also worth noting that this was far from Thuney's best effort. The rookie looked like a stud in his first preseason action against the Saints, but was up-and-down last week against the Bears and struggled against the Panthers talented front seven. Thuney's poor night was lowlighted by a disastrous second half sequence in which he was beaten by star defensive tackle Kawaan Short for a sack (negated by a defensive penalty) before failing to maintain blocks on linebackers on consecutive failed short yardage plays. A bit of a "Welcome to the NFL" moment for the rookie, who won't see many defensive fronts as loaded as the Panthers. There were plenty of familiar faces out there when the Patriots first string defense began the game, but one that most Pats fans likely needed to look up to recognize. Wearing number 52 and manning the middle linebacker spot in the base defense was none other than sixth round rookie Elandon Roberts. Matt Chatham noted during the broadcast of the Bears game that Roberts seemed to be getting a lot of positive reinforcement from the coaching staff, who were apparently intrigued enough by his improving play to give him plenty of run during this game. As with any rookie, there was some good and some not-so-good from his performance. A tackling machine (he led the FBS with 88 solo tackles as a senior) and leader of the defense as a college player, Roberts is known as an instinctual, cerebral player who is unafraid to mix it up. That showed up several times on film. The defense's second snap saw Roberts recognize, take on and defeat the "wham block from tight end Beau Sandland, tackling Jonathan Stewart after a gain of just a yard. I also found it noteworthy to see the rookie directing veteran linebacker Ramon Humber on one second half snap, showing the studious and leadership qualities that made him a valuable defender in college. His physicality also showed up as a blitzer, as he overwhelmed the running back tasked with picking him up on multiple occasions. However, Roberts has some athletic limitations that could challenge his ability to make this roster. Despite being relatively undersized by the Patriots typical standards (6'0", 235), Roberts possesses below average speed and quickness, which limits his ability in coverage and in space. While he wasn't tested in coverage, his issues in space showed up at times on the film, including a missed tackle in space on a swing pass that allowed what should have been a defensive stop turn into a solid gain for the offense. He largely played in the base defense, even coming off the field in nickel situations with the second stringers (with Jonathan Freeny and Humber staying on). The base defense was on the field more often than normal, both due to the game being preseason and the Panthers run-heavy tendencies, but that won't be the case once the regular season begins. The Pats played nickel in more than 80% of their snaps last year. All in all, Roberts still faces long-odds to make the 53 man roster. With Dont'a Hightower, Jamie Collins and the newly extended Freeny all securely ahead of him on the depth chart (along with the just-acquired Barkevious Mingo), he's likely battling Kamu Grugier-Hill for a roster spot. KG's absence last night certainly opened up more snaps for Roberts, but a healthy KG clearly has more passing down and special teams value. However, Roberts seems to have impressed the coaching staff, and would be an ideal practice squad candidate to stick around and develop as important depth down the road.